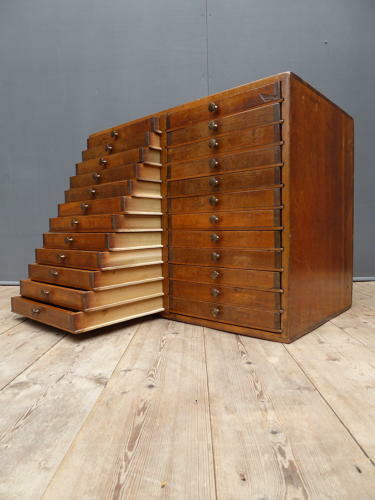 A stunning early bank of English printers drawers by Frederick Ullmer Ltd. An exceptionally well made piece with twenty four drawers all retaining their original contrasting metal handles. The whole piece is a wonderful age related colour with a beautiful patina, the rear of the chest bears a large stamped makers mark & each drawer interior is fitted with it's original paper lining. Frederick Ullmer Ltd were a recognised London maker of top quality industrial printing goods during the late 19th & early 20th century and were extremely well known for their version of the 'Albion' printing press. This exceptional bank of drawers is a beautiful example of their work & makes a wonderful display piece. UK courier service available at £19 tracked & signed for 24 hour delivery.